Who doesn’t love a Corn Dog? This delicious homemade version is perfect for Halloween parties and pre-trick-or-treating eats! Heat the vegetable oil in a large pot to 350°F. In a large mixing bowl combine the cornmeal, flour, sugar, baking powder and salt. Stir well. Add the beaten egg and milk and whisk until well blended (the batter should be a little thicker than pancake batter; add more milk if needed). Remove the Hoffy Hot Dogs from the package and dry them well on paper towels (this will help the batter adhere better). Insert a skewer or wooden stick into each hot dog. Pour the batter into a tall drinking glass. Holding by the skewer, dunk the hot dog into the batter to coat well. Lift the hot dog out of the batter, allowing excess batter to drip off. Gently place the corn dog into the hot oil (stick and all!). Cook for 3 minutes, or until the corn dog is golden brown all over, turning the corn dog in the oil, as necessary. 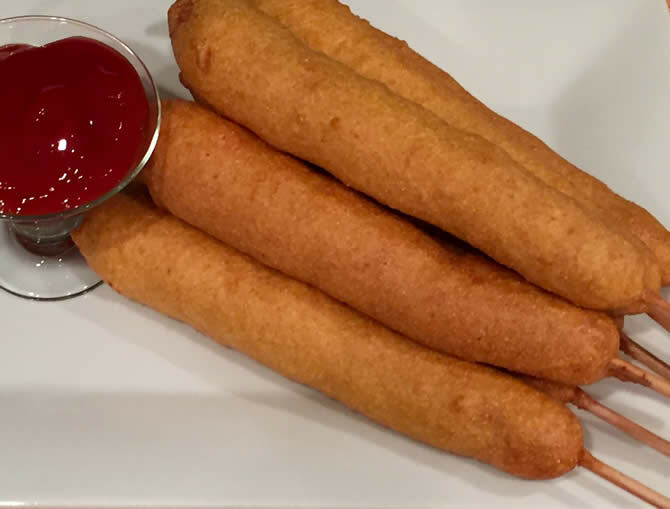 Remove the corn dog from the oil and drain on paper towels. Repeat with the remaining hot dogs. Serve with ketchup, for dipping.